Buenos Aires is known as the Paris of Latin America, and at its best, it is indeed a spacious, beautiful, prosperous and cultured city. One of the factors which makes it cosmopolitan is the number of cafés or bares – there is one almost literally on every corner in the microcentro. The city conducts its life in them, at every level. 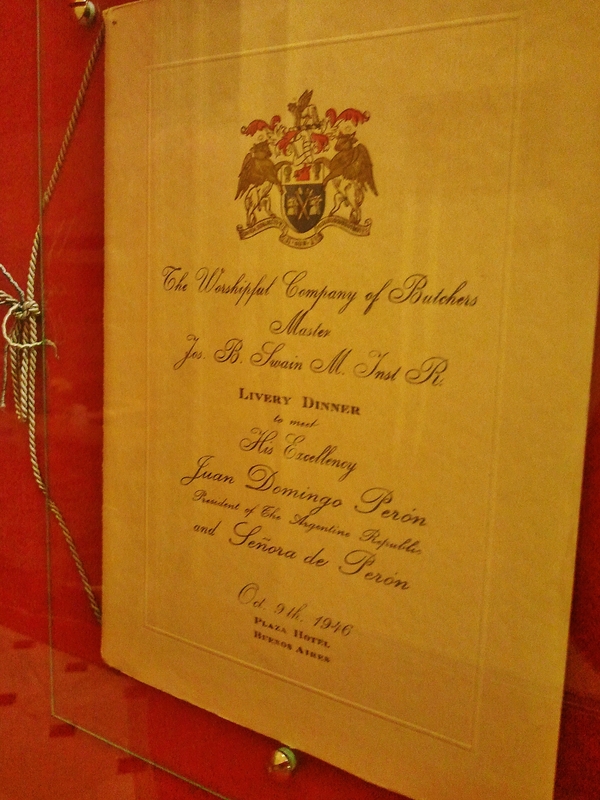 The Plaza Hotel has been an upmarket destination for more than a century. Overlooking the Plaza San Martin in Retiro, it was opened in 1909 and hosts the wealthy and the well-known to this day. Its bar is a destination in its own right. The wood-panelled decor, buttoned leather and subdued lighting make for a relaxed ambience, and its high tea – cakes, sandwiches and a decent pot of tea – is a welcome treat. The skill with which the barman mixes drinks for his regulars suggests that he can provide a treat too, should you be in the mood. On Wednesday evenings they have live jazz music. At the everyday level, cafés abound. The Florida Garden opened in 1962, a meeting point for the avant-garde of the day. During the week it is more a businessman’s venue, with a pleasant mezzanine floor offering an elevated view of the daily bustle. The double counter is workplace and service facility, and the copper accents extend from the coffee machine over the decorated walls and up the stairs. They serve a decent coffee and the usual medialuna (croissant) with ham and melted cheese. It also sells coffee beans loose. The constant stream of customers confirms that it is still serving them what they need. Out in the quieter suburb of Recoleta, overlooking the plaza in front of the renowned Cementerio de la Recoleta, is the equally famous Café La Biela. Opened in 1850 when the area was still farmland, and the vegetable garden of the local monastery only recently converted into the first public cemetery in Buenos Aires, it was a small pavement café on the site of a general store. As the city grew and as the well-off moved further north to escape the yellow fever breaking out in the lower land by the river, the café grew and changed, hosting the members of the Civil Pilots Association, and in its second century, racing car drivers and enthusiasts from Fangio and Jackie Stewart to Emerson Fittipaldi. It takes as its symbol the connecting rod or ‘conrod’ from a car engine, known in Spanish as la biela. Sipping coffee, we saw customers reading the newspaper, having a meeting while the car waited outside with driver, having their shoes shined at table, taking the afternoon sun on the terrace, or planning their visit to the Cementerio. 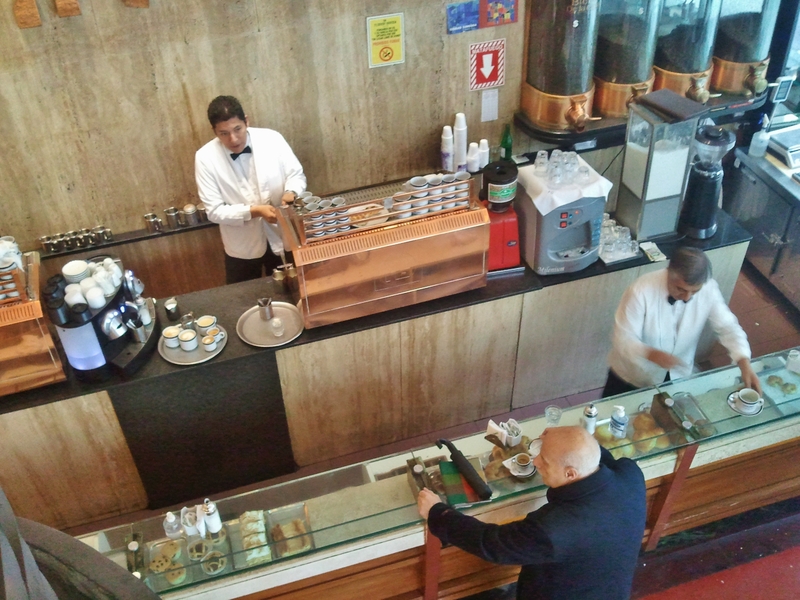 Buenos Aires takes its café culture very seriously, and prefers it traditional. El Petit Colón has the look – traditional ceiling mouldings, wooden furniture and bar, patterned wallpaper, brass fittings, black and white photographs, and spectacular light fittings. It’s popular with the lawyers who work around the nearby Palacio de Tribunales and with business people, as well as with the theatre-going public at the Teatro Colón from which it takes its name. 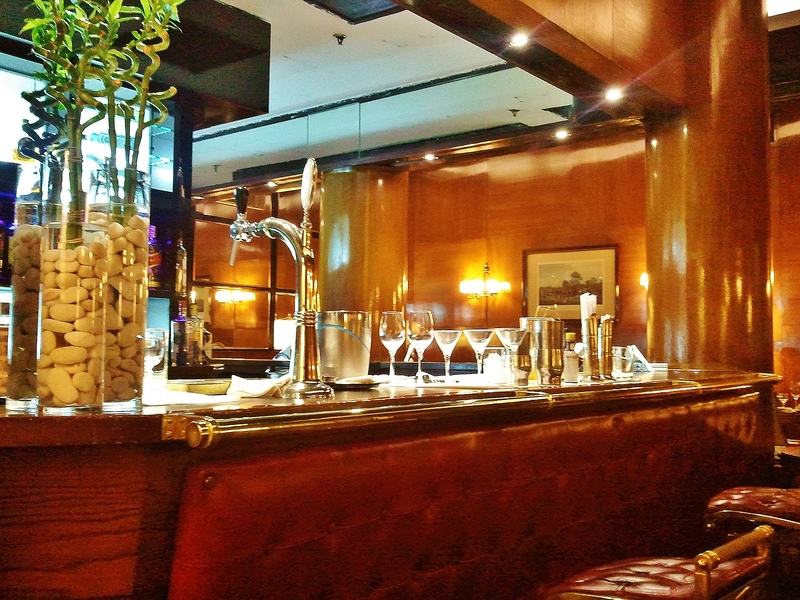 Fast attentive service, good bar food and the usual excellent coffee complete the package. Difficult to tell that it opened as recently as 1970. 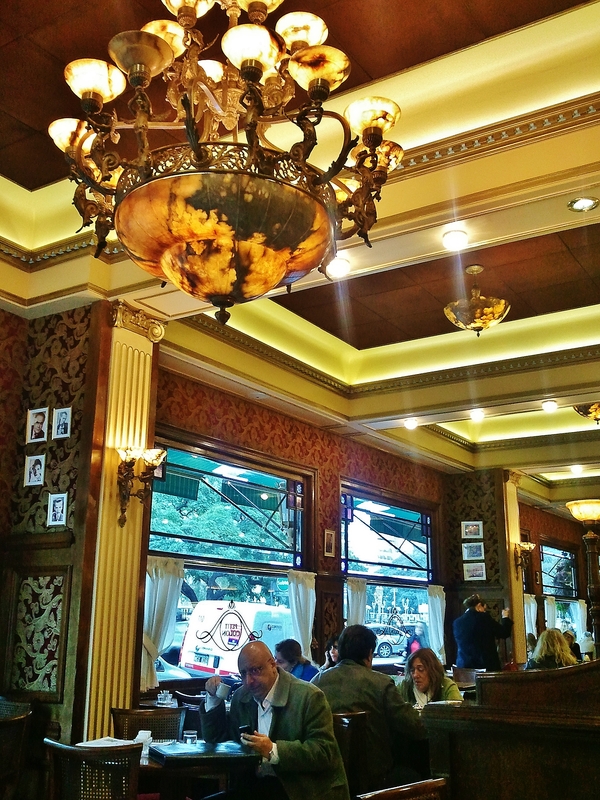 And so to that venerable Buenos Aires institution, Café Tortoni. 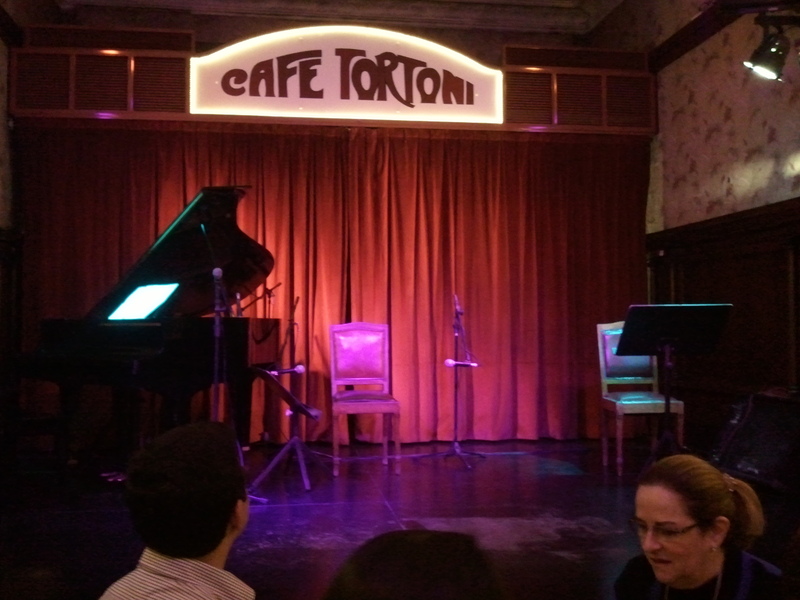 Whether you ask where the best café is, or the best tango show, you get the same answer: Tortoni. Founded in 1858, and a feature of city life for generations, this café is such a landmark that if you look like tourists, and a little lost, as we clearly did, the locals give you directions to it unasked. Here too the decor is in brown, beige, off-white and gold, with stained glass, brass light fittings, black and white photographs, wood and leather chairs, and the usual food and coffee. It’s the original style to which El Petit Colon pays homage. The costumed waiters play their parts well – we saw one grip a bottle of agua in the crook of his knee to open it with his free hand – and towards the back the cultural life of the café is celebrated with photographs, bronze busts and a souvenir shop. On the left hand side at the back is a separate room for the tango performances, seating 50 or so at tables, with a stage at the far end for musicians, singers and dancers (though not all at the same time). The show we saw featured a pianist at the baby grand, a stony-faced bandoneon player centre stage and an electric bass to the right, with just enough room in front for the singer or for a pair of tango dancers. The performers walked in through the audience, and the dancers changed behind the curtain. A technician at the back ran sound and lights for an appreciative audience of visitors. 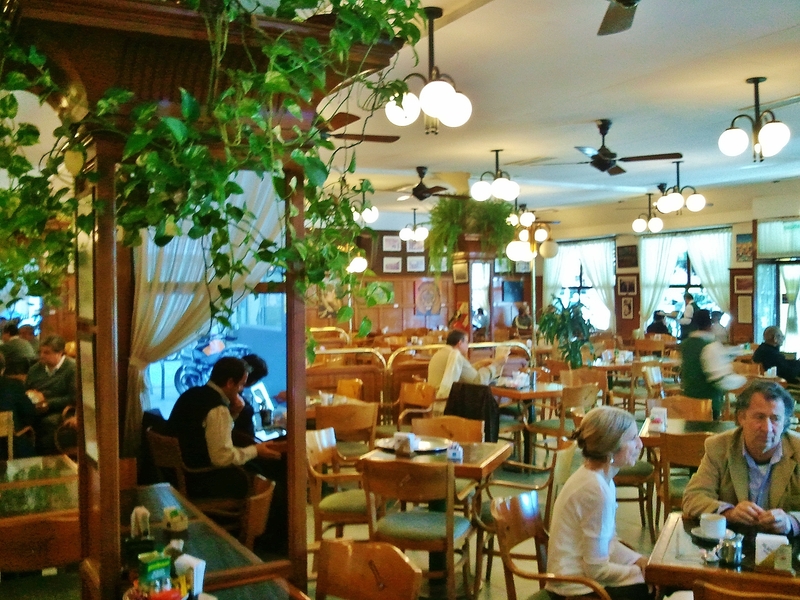 Café Tortoni is one of more that 70 cafés and bares declared Bares Notables by the city. Although supported by the city’s programmes, the status of such establishments does not prevent them from closing. They find ways of promoting themselves – tango shows, websites, supporters clubs – which raise their profile. 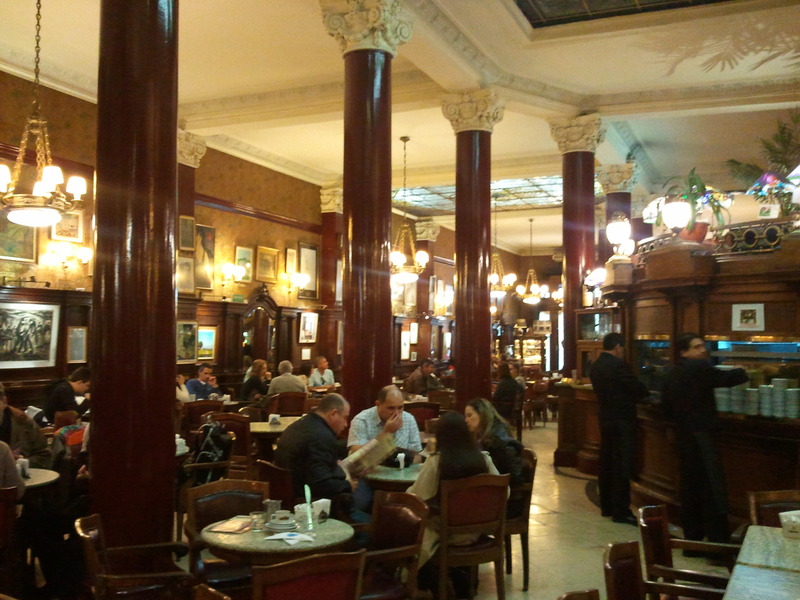 Some recent establishments are experimenting with a more modern style – the Grand Cafe in Plaza San Martin is said to deploy a New York style – and such adaptation is needed for café life to survive. Clearly they are no longer the home from home of working men as seen in the early photographs, but as long as they provide what the Porteño – the citizen of Buenos Aires – needs, they will thrive. It seems that Buenos Aires needs a sense of history with its coffee, its medialuna and its WiFi.